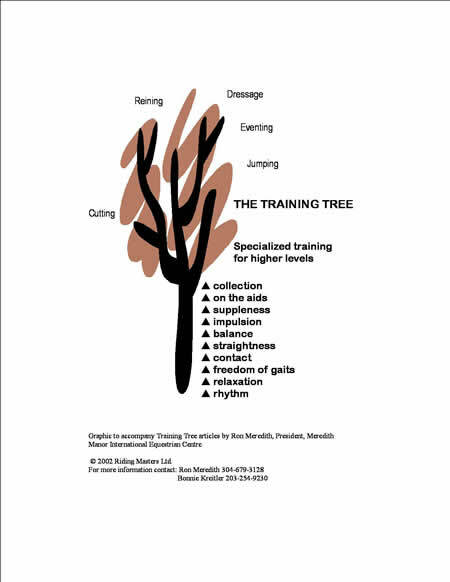 WAVERLY, WV--Collection is at the top of our training tree and it is another one of those mythunderstood words out in the horse industry. A lot of people look at a horse and say hes collected when hes really just all bunched up in front. Maybe hes got a lot of activity drive and the rider is hanging on his mouth so he cant move forward and spend it as freely as hed like. So he curls up his neck and prances around and people who dont know any better say hes collected. Or maybe the rider doesnt really know what it means to have an independent seat and put her horse on the aids. She just fusses with the reins and the horse, being an obliging sort, bends at the poll, tucks his nose, slows down so she thinks her horse is on the bit and that shes got collection. When people try to describe what collection looks like, they talk about the horse shortening his frame. If you draw an imaginary line around a horse when hes standing still, you can describe where his body is relative to the sides of that box as he begins to work. When people talk about a horse lengthening or shortening his frame, they mean how he looks in that imaginary box relative to where he was when he was standing still. He may have stretched out and lengthened his spine so his nose may now be sticking out the front of the box or maybe hes gathered himself up so that now theres some space between his nose and the front of the box. In true collection, that frame shortening comes about because the horse shifts his weight to the rear so that his hind feet are closer to his center of gravity. He does this by increasing the bend in his hocks which lowers his hindquarters. Now if you look at the horse relative to the sides of the imaginary box, it looks like hes traveling uphill in a shorter frame even though hes standing on level ground. Theres one more thing thats got to be there for true collection. When a young horse or a horse thats lower down on the training tree moves with impulsion, their stride becomes bigger and longer, more forward. When collected horse shortens his frame and lowers his hindquarters, however, his impulsion or thrust off the ground becomes more up than forward. Now the horse thats framed in that box is the picture of coiled power. Some people pull their horse together in a shorter frame, slow down the rhythm so hes taking shorter strides and think theyve achieved collection. But it isnt collection because the impulsion, the way he pushes off the ground, stays the same. In true collection, the horse must lower his hindquarters and push off the ground so that he moves his body more up than forward. It takes a lot of muscle to do collected work. Its extremely difficult. Its not intended to be something simple and you cant take shortcuts. A really talented, athletic young horse may be able to achieve collection in two years of training. Many horses may need as long as four or five years of working four or five times a week before they have the proper muscling to compete as a grand prix dressage horse. Different horses will take more or less time. And not every horse is going to have the physical potential to reach the top levels in whatever game their rider has decided to play. The horse needs to go methodically through every step in the training tree in order to develop the muscles he needs to play at the upper levels. Whether its a dressage horse or a reiner or a cutter or an event horse, you can look at the horses muscle development as he goes into the arena and predict whether hes going to be able to give a good performance or not. If he doesnt have the muscle, you know its not going to be a good performance because the horse hasnt been conditioned to do the job.